in Italian, the word means "odes" as well as "hates"
ODI project began in 2015 in Valchiusella (TO) as a theatre workshop and video documentary, lasting 4 months. The workshop worked with a group of about 30 asylum seekers from Nigeria, housed at the time in the village of Alice Superiore, a few meters from BILOURA's working space. It was an experience that left its mark. So, at the end of the ethno-anthropological workshop, BILOURA decided to transform "ODI" into a permanent laboratory, which take place wherevere there is a critical intercultural situation. ODI is the possibility for creative expression without linguistic barriers, with attention to different cultural sensibilities: a privileged space-time of aggregation and integration, of understanding and appreciation of the individual within the intercultural group, using theatre and film as tools for the expression and well-being of the person. 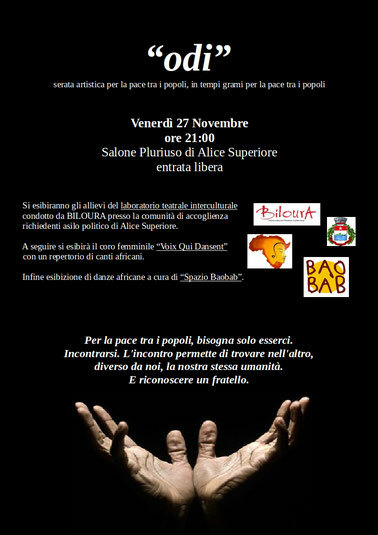 ODI is coordinated by the actress and pedagogue Silvia Ribero and by the filmmaker and anthropologist Sara Casiccia, often assisted by musician and performer Angie Rottensteiner and by the educator and philosopher specialized in gender studies and conflict resolution Sophie Brunodet. BILOURA, in fact, as an artistic, intercultural, polyglot and transdisciplinary collective, commits different skills, all relevant and useful to the full success of the laboratory. The participants of the first ODI meetings in 2015 in Italy did not only express trough theatre and interviews the tragedies they have passed trough while crossing Northern Africa and Mediterranean See in order to find a better and safer life in Europe. They didn't just find in creativity a valid tool for their lives, they also have presented themselves in front of the Italian public as human beings full of talents and dreams for their own futures. By doing so, they contributed to reinforce the dialogue between Italians and migrants and bridges were created. ODI first session has been video-documentated by philospher, director and anthropologist Sara Casiccia, whom has chosen ODI as object of her Master Thesis in Cultural Anthropology by Turin University. the multiethinical transformation of western society is often lived with fear and tension.